First of the 'B' class ships to leave the Clyde sailed on Friday afternoon. MAERSK BOSTON is seen heading towards the Ashton Buoy as MAERSK BEAUMONT continues to prepare for her return to service at the Alpha anchorage. Just visible alongside MAERSK BEAUMONT is one of Clyde Marine's tugs, acting as a support vessel for divers engaged in cleaning work on her hull. Heading past Gourock with Svitzer's SVITZER MILFORD made fast at her stern, MAERSK BOSTON gets into her stride, moving under her own power for the first time since she anchored in Loch Striven on 20th August 2009. Another view as she makes her way downriver, MILFORD still fast aft as a precautionary measure should anything untoward happen. Last view of MAERSK BOSTON, heading down the main Firth of Clyde Channel and slowly building up speed, having now released SVITZER MILFORD. MAERSK BOSTON was heading for Portland, on the English Channel, where she would take bunkers before setting out across the Atlantic. 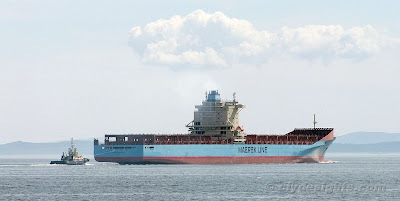 She is due to arrive at Suape in Brazil on 2nd July, and then Santos a few days later.